Working in DUI defense is harder today than ever before. The challenges you face in and out of the courtroom are considerable, and you are almost always facing an uphill battle to get your client the results that he or she wants and needs. DUI defense attorney Jay Tiftickjian understands the difficulties of DUI cases intimately, which is why he was proud to take the role of editor and contributor for the first volume of the Colorado Criminal Defense Bar’s DUI Defense Manual, published by the Colorado Criminal Defense Institute in 2015. In addition to his work as editor, Jay Tiftickjian also contributed chapters about closing arguments and sentencing, as well as a chapter on professional consequences co-authored with attorney Abe Hutt. Any attorney that wants to get the best possible results for his or her clients can benefit from the DUI Defense Manual. If you are new to DUI defense, the information found here can provide a solid foundation in understanding how to do the best possible job you can for those that you serve. For attorneys with more experience, the manual serves as an excellent resource when you have questions about particular areas of the process – authored by those who are experienced and proven in DUI defense. 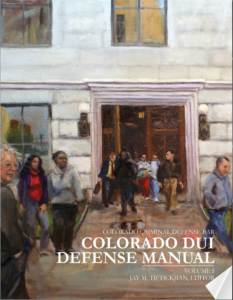 Colorado Criminal Defense Bar DUI Defense Manual can be purchased from the Colorado Criminal Defense Bar website at a reduced price for members.